Summertime in Alabama means fresh peaches and each summer one of the things Alabamians most look forward to is getting our hands on a basket of Chilton County peaches. Chilton County is known to have some of the sweetest and juiciest peaches in the state. Most people stop and pick up a basket or two on their way to and from the beach. And Alabamians are not alone! Thousands of folks from other states heading to Gulf Coast on I 65 do the same thing. Just south of Birmingham, people know to start looking for the giant peach water tower that moons interstate travelers as they slide toward Montgomery. If you want a basket for yourself, just take exit 205 in Clanton and go right....or left! On both sides of the exit are two of the best peach stands in the whole state. 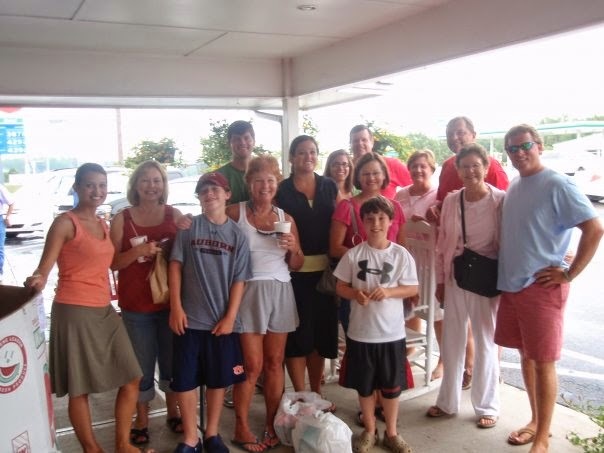 Our family during one of our many stops to pick up peaches on our way back home from the Gulf. If you turn right, you will find Durbin Farms and if you go left, look for the Peach Park. Either way, you can't go wrong! Both of these glorified farmer's markets have more than just peaches. You will find fresh, locally grown fruits, vegetables and homemade goods of all kinds. There is a restaurant at each location, too. The Peach Park has barbeque, fried chicken, ice cream and peach pies, just to name a few of their offerings. Durbin Farms has chicken salad, sandwiches, salads, desserts and, yes, ice cream. I had to take a quick trip to Montgomery the other day, so I veered off the highway right at exit 205 and picked up a big basket of Topaz peaches to bring home with me. Most of them ended up in two peach cobblers for the 4th of July. Some of them were eaten right out of the basket, which is my favorite way to eat a peach. However, there were eight left over after all was said and done. I had the idea to make a peach pound cake. I've never made a peach pound cake before, but the possibility sounded good, so I gave it a shot. I started with 2 sticks of butter at room temperature and 2 cups of sugar. I creamed these together until they were light and fluffy, about 5 minutes. Then I added 6 eggs, one at a time, incorporating each one fully before adding the next. Next I added 1 t. vanilla extract and 1 t. almond extract. If you aren't a fan of almond flavoring, you could just add 2 t. vanilla or substitute peach or rum extract for the almond. In a separate bowl, I stirred together 3 cups all purpose flour, 1/4 t. baking soda and 1/4 t. salt. I added this mixture alternating with 1/2 c. sour cream to the butter mixture. Next, I peeled and chopped the 8 peaches and added them to the batter. My 8 peaches equalled about 3 cups of chopped peaches. 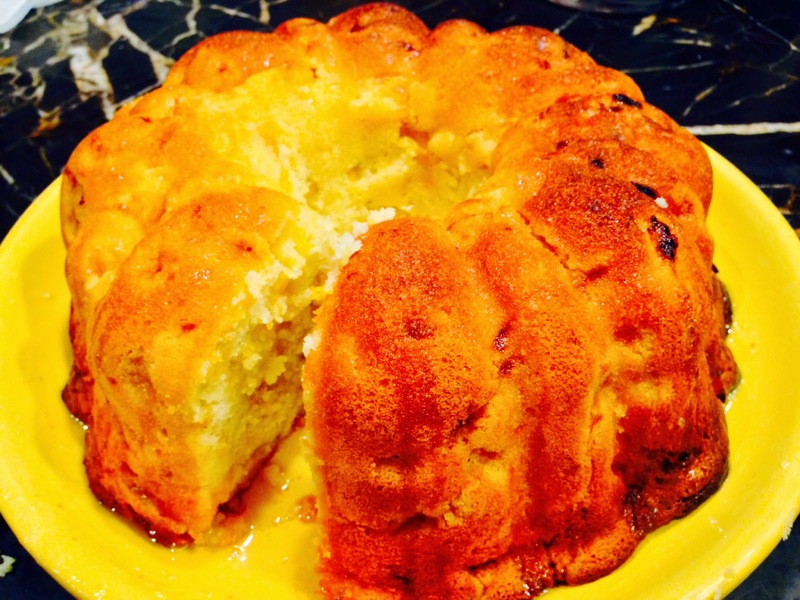 I poured the whole shootin' match into a bundt pan I had sprayed with Baker's Joy. Then I put the pan in the oven which had been preheated to 350 degrees. I baked it for 1 hour and 15 minutes until a wooden pick inserted into the center came out clean. Then, because I cannot leave well enough alone and because my favorite pound cake has a glaze that I love, I made a glaze out of 1 cup of sugar, 1/4 c. water and 1/2 t. rum extract. I stirred it all together and brought it to a boil and boiled it for 1 minute. I immediately removed it from the fire and drizzled it over the cake. This cake was really good... moist and flavorful....just peachy! Try it and let us know what you think! Bake at 350 degrees for 1 hour and 15 minutes or until a pick inserted into center of cake comes out clean. Combine all ingredients in small saucepan and bring to a boil over medium high heat. Boil for 1 minute. Immediately remove from heat and drizzle over cake.